Caption: U.S. Embassy Charge d’Affaires Joel Maybury and a small group of Embassy staff visited Hanuabada village today with their donation to victims of the recent fire. 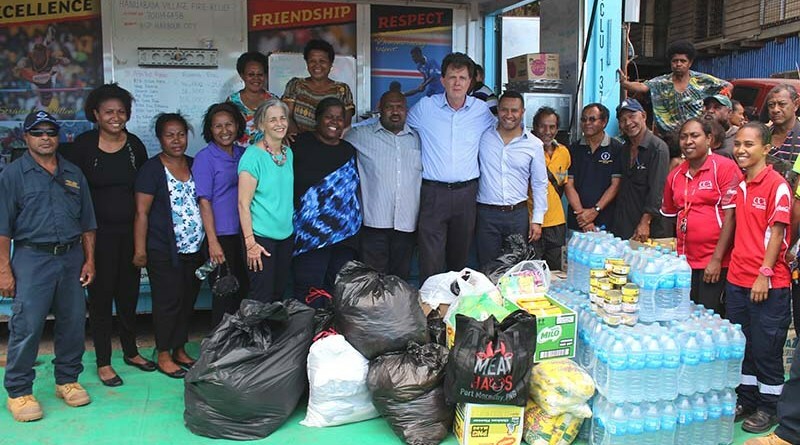 THE United States Embassy in Port Moresby and Coca-Cola Limited joined to provide relief aid to the villagers from Hanuabada whose homes were destroyed by fire on Saturday, August 19. The embassy donated bales of rice, noodles, biscuits, clothing, household goods, shoes and toiletries while Coca-Cola Limited representatives donated 20 cases of water. “The devastation to our neighboring community has had an impact on all of us and we were touched by the loss of family homes and possessions,” according to US Embassy Charge d’Affaires Joel Maybury. “We want the people of Hanuabada to know that the United States Embassy will be here to assist where it can,” he said. On hand to welcome and receive the donations on behalf of the affected villagers was Hanuabada Appeal Lead committee members Dadi Toka Jr and Lohia Boe Samuel. Eighteen homes were destroyed in the fire leaving more than 200 people without shelter.